Spicy Thai Shrimp Soup is so much better than takeout. Plump succulent shrimp in coconut curry broth with hints of lime and lemongrass for authentic Thai flavors. 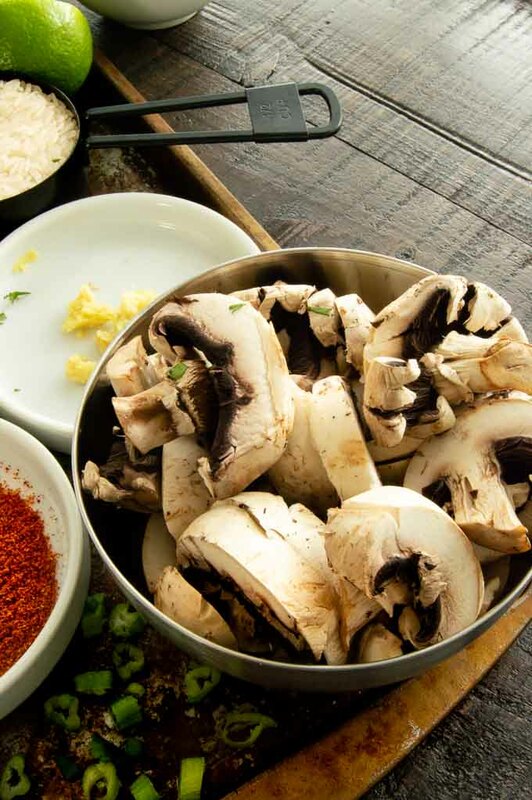 Additions of sliced mushrooms, red pepper and rice make weeknight dinner a delicious experience. I love Thai Food. Actually I love Japanese food, Chinese food, Thai food… basically any food with a big flavor punch makes us happy at our house. I’ve taken so many classes with Jet Tilla over the years we eat homemade authentic Asian Recipes all of kinds on a regular basis. It’s so much better than take-out and so much healthier too. 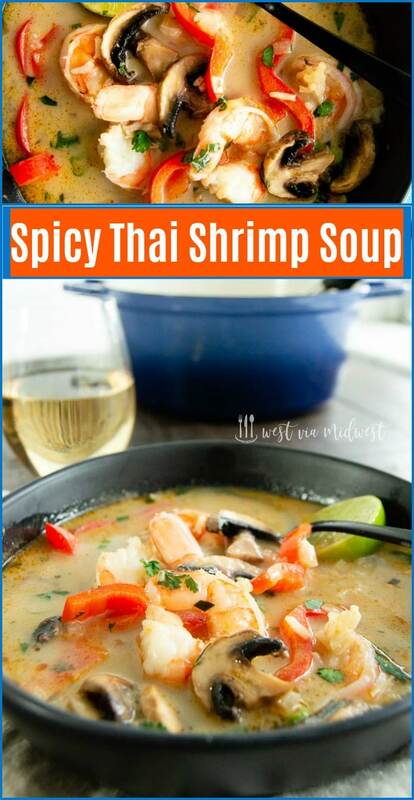 Today’s recipe for Spicy Thai Shrimp Soup is a take-out copycat of the soup you get at your favorite Thai restaurant. The broth is spicy and light with hints of curry, lime and lemongrass. The shrimp is added at the last minute so it cooks to tender plump perfection, no overcooked shrimp in this soup! Thai soup is a simple shrimp soup but it does have some unique ingredients in it. 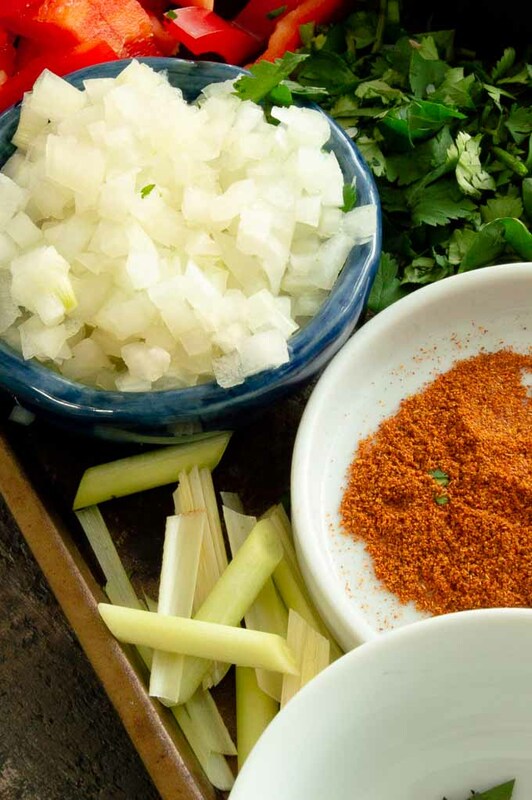 I’ve got you covered for where to buy authentic thai ingredients and what to look for when buying them so that your curry coconut shrimp soup is spectacular. Red Curry Paste is easily found in the asian section of most grocery stores. There are red, yellow and green curry pastes. Red curry paste tends to be the hottest variety but the heat level can be different from brand to brand. Actually, the flavor of curry can vary from brand to brand so you can change up the taste by trying different brands. 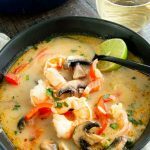 Coconut milk adds a velvety texture and a great depth to the broth in the curry coconut shrimp broth. I personally like it with coconut cream versus just the coconut milk. What is coconut cream? Coconut cream is the coconut cream that rises to the top of the liquid. You can think of it as a less watered down version of coconut milk. 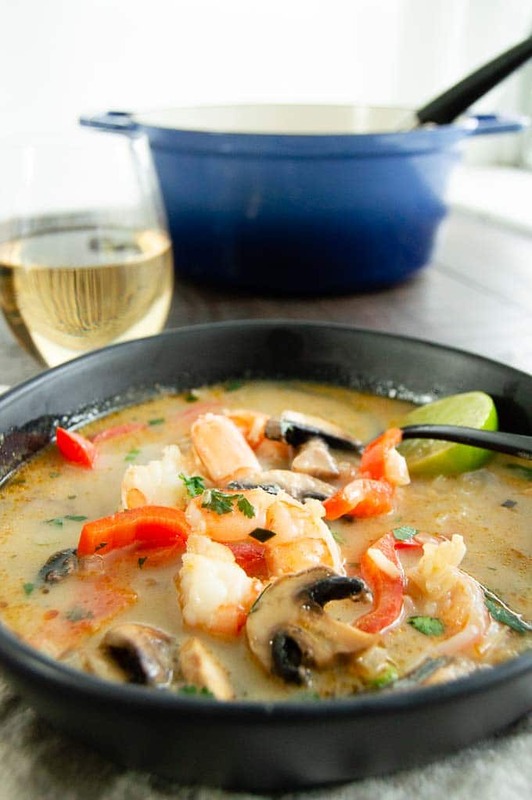 Coconut cream has a beautiful velvety texture and adds a little thickness to the thai shrimp soup base. PRO TIP: I absolutely do not recommend low fat coconut milk. It is too thin and often leaves a small aftertaste that isnt very pleasant. Lemongrass is really a grass and you can find this in the produce section of almost any grocery store. Lemongrass adds a lemon and lemon mint flavor to the soup. Lemongrass is optional in this soup. It adds a nice umami flavor and we really like it and find its worth the effort to add it but when Ive not been able to find it the spicy shrimp soup still gets devoured! Kaffir Lime Leaves are from the lime trees that are common in Southeast Asia. They are probably the most difficult item to find to make authentic Thai soup. I’ve only found kaffir lime leaves at my local Asian markets and market chains like 99 Ranch. However it can be bought online at amazon. I suggest buying a lot of it when you see it and freezing it in a zip lock bag to have it when you need it. For each tablespoon of Kaffir lime leaves the recipe calls for use the zest of half of a lime and a pinch of thyme. It’s not exactly the same but it will work for delicious, authentic Thai soup. The second most common question is how do I cut the kaffir lime leaves? It’s super easy to cut the kaffir lime leaves. Fold the leaves in half and cut out the center stem. Then cut into long thin strips that look like grass. Then cut them into small tiny squares for a minced pieces. Fresh Ginger is very common at your local grocery store. It’s economical. You can wrap what ginger you have leftover in a paper towel, place in a zip lock bag and place it in the freezer until you need it the next time. The most common question about ginger I hear is, how to I prepare fresh ginger? Use the back of spoon, peel the ginger and toss away the skin. About an inch of ginger yields a tablespoon of fresh ginger. You can either mince it or as I have in this recipe grate it using a microplane. This is one of the most often used tools in my kitchen. It grates fresh parmesan, grates zest for baking or for adding to cocktails! Fish Sauce (nam pla) is a brown liquid made of fish that has been fermented. It’s fishy, salty and a little sweet and sour. 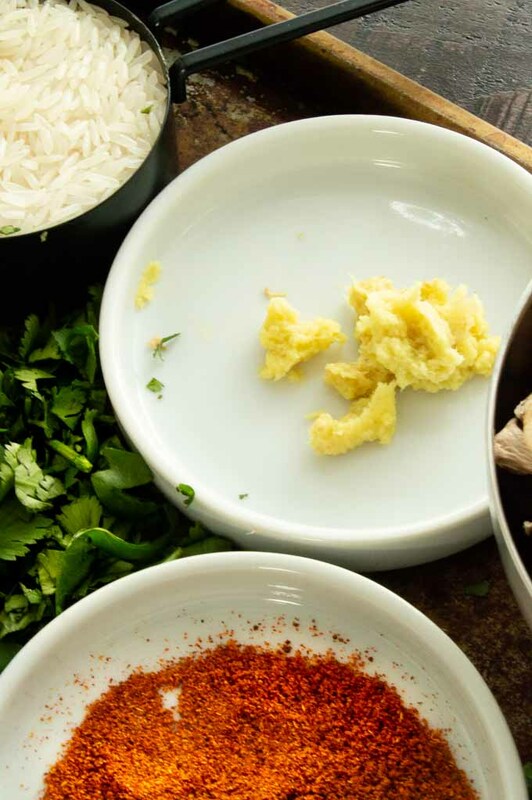 Nam Pla (the Thai word for fish sauce) adds a burst of flavor to what ever you add it to. It’s in the Asian section in most supermarkets and is easy to find. It sounds odd that fermented fish adds a good flavor to your soup, but it does. If you don’t have any fish sauce on hand, you can substitute Worcestershire sauce. It’s not the exactly the same flavor but it works to add a smoky, salty taste to your soup. Prepare and measure all of your ingredients before hand. Use a heavy bottom stock pot that is large enough to hold a large portion of soup. Into the stock pot add chicken stock and cook the rice in the flavored broth. Add the vegetables to soften, before adding the shrimp to cook until opaque. 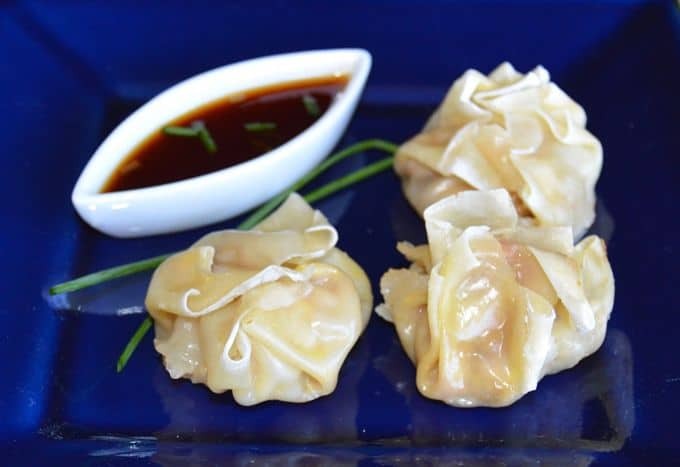 Finish with lime juice, garnish with green onions and cilantro. Want a vegetarian version? 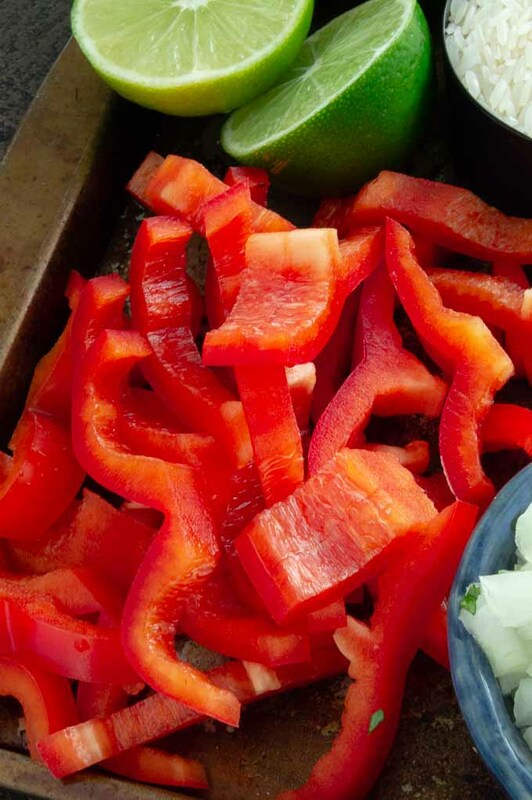 Use a vegetable stock instead and eliminate the shrimp. Double the mushrooms and peppers and add other vegetables such as broccolini, and add some more onions in larger slices. The broth is so flavorful it will highlight any vegetables. 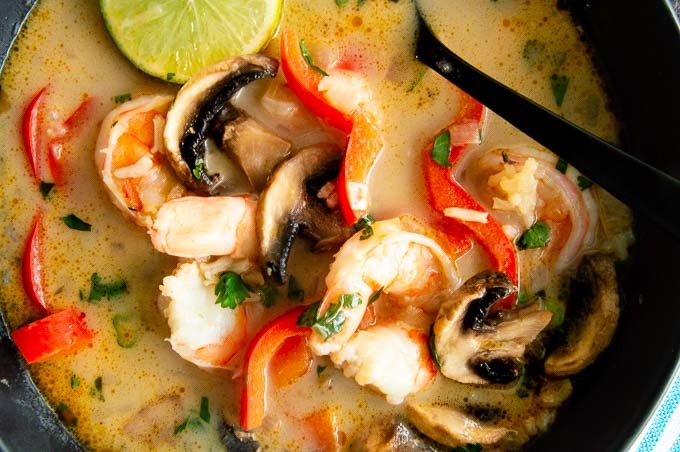 Any seafood will work in this spicy thai soup. Oysters, scallops, chunks of your favorite fish, lobster. Love all things shrimp? 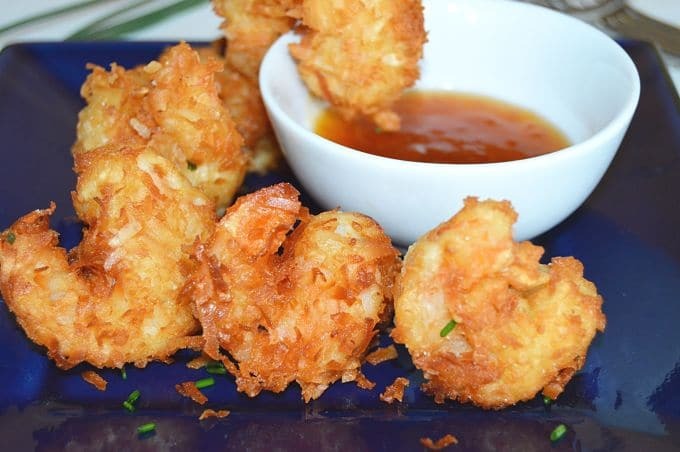 Here are some more great recipes with shrimp in them! TIPS for prepping ingredients: Ginger: Using a spoon scrape-off the skin of the ginger. (toss that.). Then using a microplane grate the ginger. Keffir Lime Leaves: Fold the lime leaf in half, cut out the center vein and toss. Them cut to strips, turn to side then mince. Lemon Grass: Use the white parts only and mince. You will need about 1 tablespoon minced. Lemon grass can be stringy and tough if you use it in big pieces, mincing it allows it to soften and release the flavor you are looking for. Chop/cut/clean/measure out all ingredients before beginning the soup. In the base of a cast iron pot or stock pot combine the onions, ginger, thai red curry (or curry paste) and peanut oil. Cook over medium heat, stirring constantly for 3-4 minutes until onions are translucent. 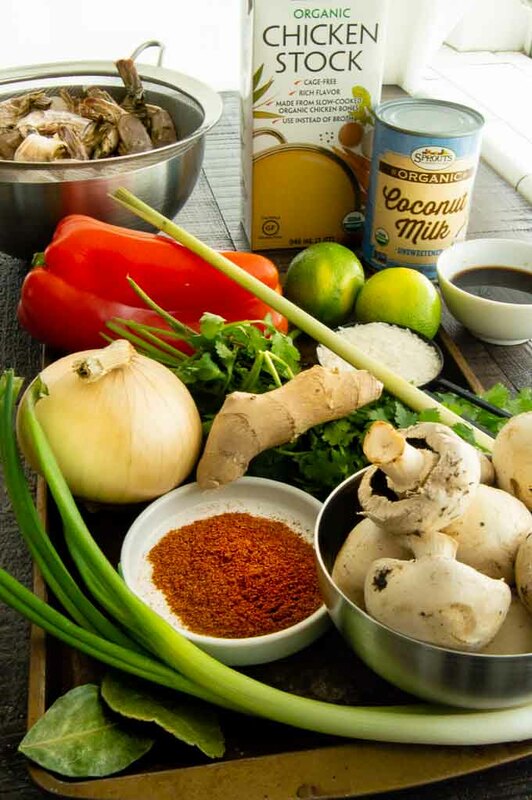 Add the coconut cream, fish sauce, sliced mushrooms, red pepper strips, cilantro, lemon grass and lime leaves. Simmer for 5 minutes, stirring a few times. Add the peeled shrimp and cook for 5 minutes until the shrimp is opaque (you cant see through it any longer) and has turned pink. Add the lime juice, stir and serve. Garnish with lime halves, minced cilantro and minced green onions. Calories are calculated on the ingredients that I specifically purchased to make this and can vary depending on what you purchase. If you are following a strict diet please calculate the calories/nurtritional info specifically to what you make. This soup looks amazing! I love all of these flavors – my fiance and I will love it! I love ALL Japanese, Chinese and Thai food as well!!! This soup is on my MUST MAKE LIST!!!!! We just love this soup, all the spicy goodness came together in this delicious meal! Five stars!!! I just love going to the Asian grocery store. My mind just buzzes with all of the possibilities and they’re so reasonable. This soup is truly special and I’m amazed that ingredients like fish sauce can add such a depth of flavor. I’m going to make this for our Valentine dinner and John’s going to love it! Thank you for sharing. So excited to make this soup. I just need the kaffir lime leaves. Fingers crossed our local Asian market has them stocked, so I can store them in the freezer (great tip!). Also love that you suggest the full-fat coconut milk. I never buy the low fat anymore for the reason you mentioned. I am a fan of all things Thai. Its one of my favorite cuisine recipes. This shrimp soup looks amazing. This looks great! All these delicious flavors in a nice healthy comforting bowl of soup. Perfection! Thanks for the recipe! It taste like my favorite restaurant made it.